Heavy Metal Thunder & Ride The Lightning! It’s been a while since we pumped out some pieces but here we are again. This time with something very special (at least for us). 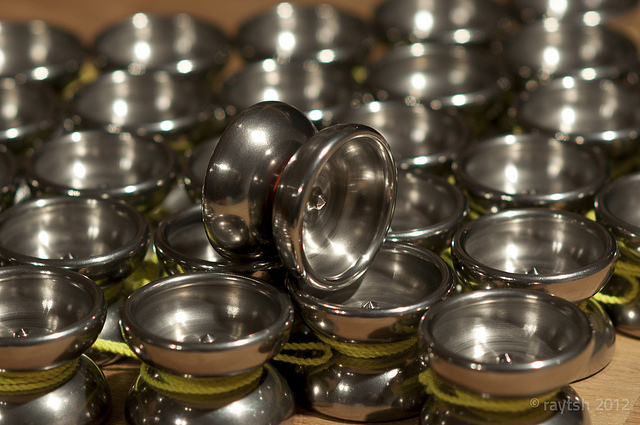 Back in day in in 2006/07, when the high-end metal market was born, we got our hands on two yoyos we still treasure to this day. The Radian MKII by SPYY and the Air Rider by AnY. Both yoyos were way ahead of their time and blew us out of the water. Sadly, these models haven’t been in production for many years. Frank remembers fondly what a thrill it was to purchase a high-end yoyo back then. 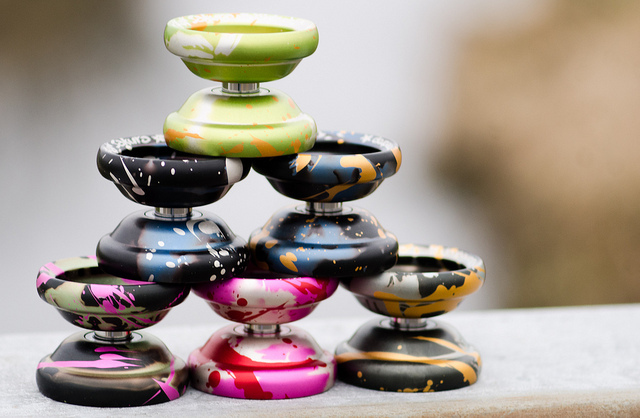 It felt like there was only one or two big yoyo releases per month and everybody talked about just a hand full of models. Some of you might remember the Eetsit or Bapezilla for instance. The Air Rider was incredible expensive compared to what the marked had to offer at this time and a lot of thought went into the purchasing process for him – it was way over the budget. Frank thought day and night if it would be reasonable to put such a great amount of money on the table – it’s still just a toy, right? The final conclusion was: “Ah, whatever!” That’s usually not the sign of a rational decision, it was about passion. After the decision was made and the order had been placed the long wait for the overseas shipment with customs and all the hassle was quite nerve wrecking. He remembers tracking the package at least once a day and getting worried that the shipment might get lost in transit (what never happened once in all these years). Finally throwing the Air Rider was thus even more exciting and Frank was quite afraid of damaging such a precious yoyo. The buying and playing experience is still memorable and vivid to this day and hasn’t been matched by any other yoyo – it was just special. Looking at the yoyo today still invokes all these memories and emotions. When Dominik met Frank for the first time, his Radian was currently being shipped to Germany. However, Frank brought his Radian and Dominik was immediately hooked when he held it in his hands for the first time. Even though, Dominik got a Pyro a few months earlier (his first modern metal yoyo), the Radian put its spell on him. It’s still one of his favourite yoyos and thus it was only reasonable to pick the MK2 when the idea to recreate classics arose. Compared with to flooded market today with too many models from too many manufacturers that get released over a short time span, the increased price of high-end models and the consistent high quality of lower priced yoyos, it just does not feel as special anymore to purchase and receive a high-end metal yoyo. Most yoyos feel and look the same these days. With Shapes dialling in on competition style with straight v-profiles, finger-spin friendly hub areas and high RPM centre weight focused designs, we miss these classics even more. Naturally, nostalgia was a great factor that went into the decision of creating yoyos that are directly inspired by beloved classics. Because of this and the fact that both manufacturers are out of business by now, we decided to bring them back with ILYY flavour. On a side note: Frank always wanted an Air Rider with o-rings (Dominik still has one but is not willing to part with it), what was kind of hard to get back then. The Lightning is an homage to the AnY Air Rider with even more power and stability. The pads are gone and have been replaced by our trusted Hot Red sILYYcone response system and the typical metric bearing. The Thunder features a similar profile as the Radian does but has “edgier” contours and sports a large KMK bearing als well a our Hot Red sILYYcone response system. For the engravings, we’ve used a font called Sunbather from the Artist Nick Steinhardt that was used on the identically named album Sunbather by Deafhaeven. These are just prototypes for now. We have not yet decided if we will follow up with a production run. These colours are only for the prototype batch, they might change for a release (if there will be one). 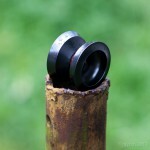 The chances are slim, since we don’t expect any demand for yoyos with this “outdated” style as some testers called them. For now, there are 5 prototypes of each model available for sale. If you are interested, just send us an email. Long time no post. 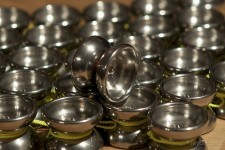 We’ve been busy with our private lives, but are still into making yoyos. Expect new models soon. The first release of 2014 is the second production run of the Trvth. 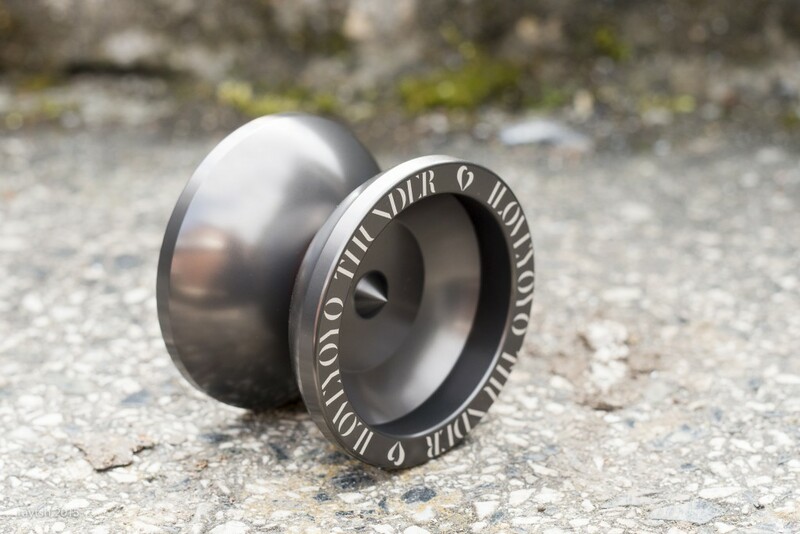 We kept the specs of the second prototype and decided to only engrave one side of the yoyo (just like the SB2). Limitation on this one is 30 pieces. 10 will be available from YoYoExpert within the coming weeks. This time we have something special for you guys. We teamed with the awesome guys of the epic Technical Death Metal band Nile and used their band logo for the laser engraving. How cool is that?! Shipping next week. Will be available at YYE, LTYY, YYSR and Yo-Shop. After quite some time we can finally show you the second prototype of the Nile project (v1 left, v2 right). A few will be available at the WLYYM13 in Weimar and later at Yo-Shop.de if there are still some left. ILYY and OneDrop join forces! This has been cooking for a while now but we can finally announce the result of joined forces between OneDrop of USA and ILYY. The SE Sakura! 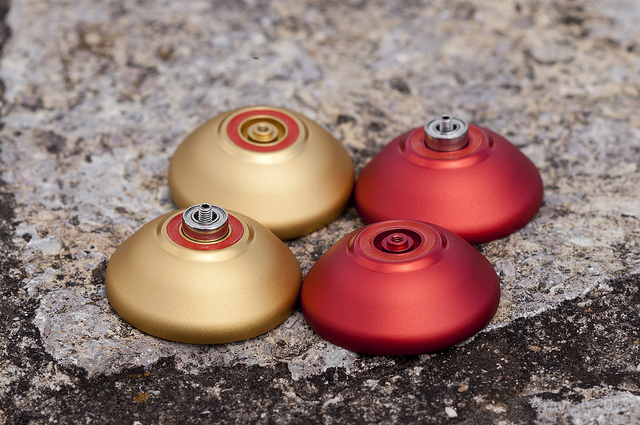 OneDrop created a brand new side effect for the SE Sakura resembling the original shape of the horn. 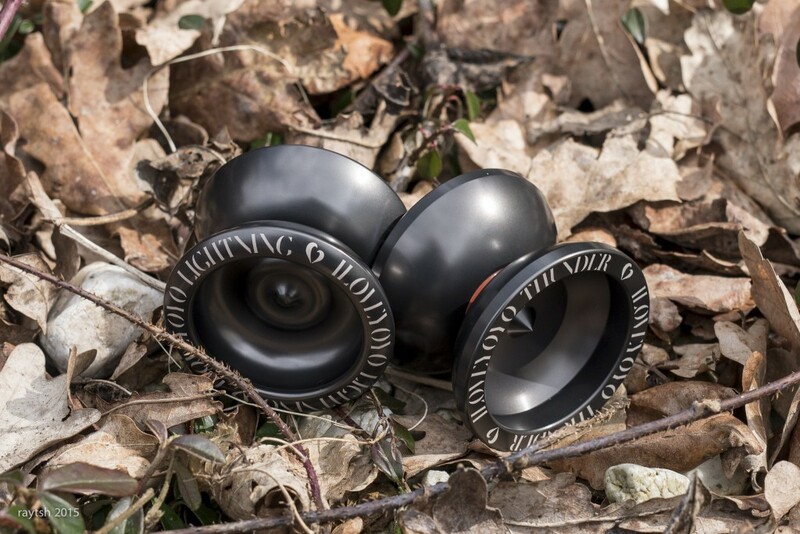 We incorporated ace laser engraving to every yoyo. 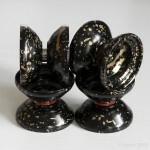 They will be available from the OneDrop store on February 25th with discounted international shipping. We joined forces with IrPad to create pads that will fit all our future and past large bearing yoyos. The pads are just slightly recessed to provide snappy binds while maintaining unresponsive play. IrPads are well know for their consistency in response and long durability amongst players world wide. 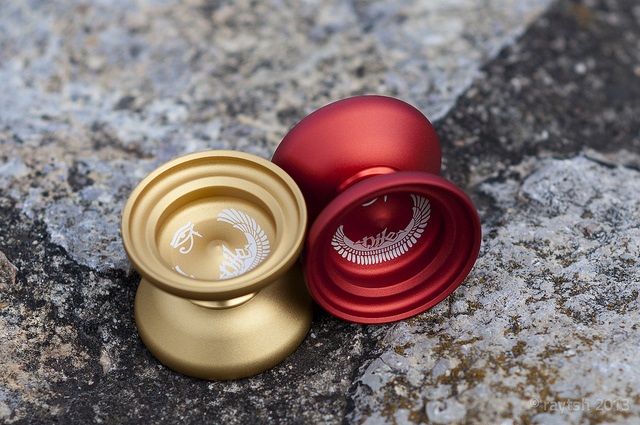 We might switch to pads entirely at some point, but for now, our yoyos will still come stock with our signature sILYYcone response. The pads can be used as a replacement for our stock sILYYcone. They will be available at your favourite retailer soon. There will be a total of 11 prototypes for sale. You can buy them directly from us via email for 75€ plus shipping. The remaining ones will go to international shops. 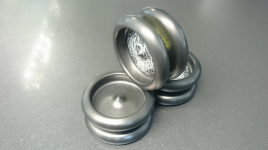 Since we have no experience with high RPM/mid-weight-focused yoyos yet, further testing and feedback is required before we decide if we keep developing this design. It plays great, but feels vastly different than what we are used to. We are not sure if it feels “right”. 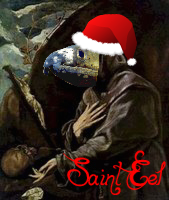 We decided to go for a final batch of Saint Eels for this Christmas. This time, they are finished by vibratory grinding in two steps. The first being ceramic pellets followed by wallnut shells. This gives the outside of the halves a smooth polish-like appearance while the inside keeps its machining looks. The specs are the same as those of the last batch. Around 30 were made. These will be the last Eels to slither out of our shack. If you want the reigning micro-yoyo king, keep your eyes open. Those will ship soon to retailers. We decided to take a dive into the centerweight-trend and Frank began designing a new yoyo he called Nile. Here are his notes on the design along with a first CAD render image. As many people suggested, I’ve designed a yoyo in the modern vein. More centerweight and thus higher RPM that is. Its all about getting the right balance between spintime and RPM. So we needed to shift some weight to the center to get higher RMP value. So, here is our first dip into high RPM yoyos. As you can tell, we have this typical yoyo in a yoyo design here. 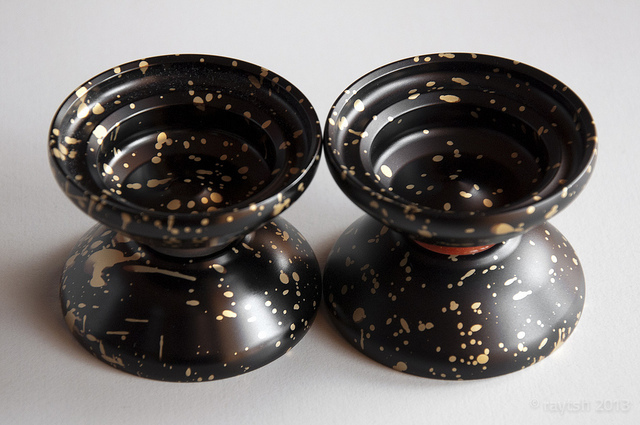 The inner rim area has a diameter 36.44mm the outer diameter of the inner yoyo is about 45mm. The whole rim stretches over 9.78mm. I’m not quite sure if this is enough to make a huge difference playwise. But we’ll see. The rims have linear elements (parallel and collinear) that reduce visual tension. I was going for round lipped rims first but that way it got way too heavy. In order to maintain a small (diameter) inner yoyo, I had to cut away a part of the rim, thus it is flat now. I had difficulties getting the outer rim thin enough to shift enough weight to the center while still maintaining a good haptic. We had this issue with the fist Lynx prototype as well: it had too thin rims at the outermost point. Therefore it felt quite unpleasant and gave a cheap impression. Both rims might be useable for thumb grinds. However, this is just a design study, we have yet to try it out once it is machined. A high wall (flat area around the response area) is more or less absent this time. That should prevent the yoyo from tilting too much if the strings are not perfectly parallel. I’m not into horizontal play, as a matter of fact, I can’t do a single horizontal style trick. But this feature should suite this playstyle well. Correct me if I’m wrong. 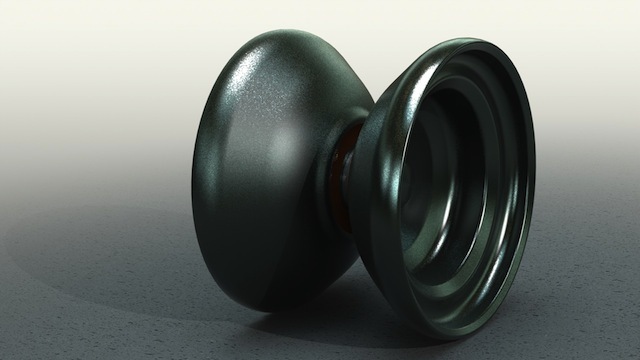 The profile turned out to be quite traditional, what is good for a competition yoyo, I guess. But basically it follows the inner shape (horn to rim). That’s quite a difference for me. Usually, I focus on the profile first. The inner area just arises from working out the desired weight. But this time, it’s different. The top area of the profile meets the rim in a Lio-ish kind of way. I really like that, it should result in a quite comfortable hold. Overall, the design incorporates flat and curved surfaces, I tried to keep it as consistant as possible and threw in some linear parts here and there as you can see in the profile and from the horn to the rim. I took some inspiration for the name from one of my favorite metal bands – Nile. I was listening to their music while designing the yoyo. The name also serves as great basis for an awesome engraving that has yet to be created. The Egyptian mythological theme will be realized by a certain coating or color way. Prototype will be made in the next weeks. I hope to get it before the Christmas holidays. By the way, any similarity to any existing yoyo is just coincidence. 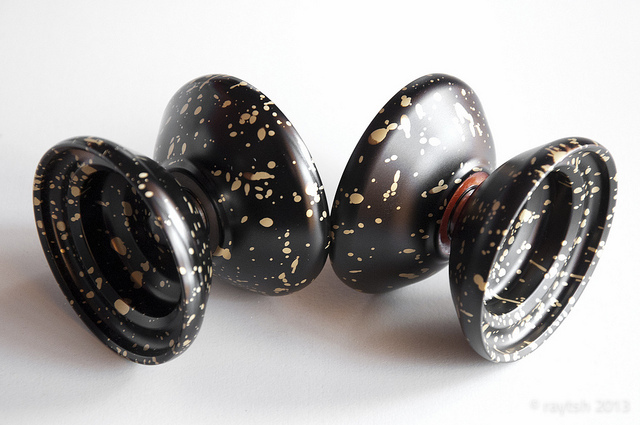 I intentionally did not look at yoyos that feature this particular style before I started designing. I wanted my design to be as unaffected by existing designs as possible. But as a matter of fact, yoyos tend to look more similar to each other than, say 2 years ago. The design features are nearly the same overall. That is especially true when it comes to a certain style of yoyos, as seen here with the centerweight/higher rpm focus. More information will posted soon. Stay excited!